D-B13 Portable Bluetooth Speaker features bluetooth 2.0 technology, which makes its lower energy consumption but more stable connection and faster transmits speed. D-B13 Portable Bluetooth Speaker features bluetooth 2.0 technology, which make its lower energy consumption but more stable connection and faster transmit speed. With built-in battery, can be long standby, perfect for traveling, morning exercises, jumping square dance and so on. • Can play TF card and U disk MP3 files directly. • Support Bluetooth 2.0 version below, you can connect to mobile phones, laptops and other Bluetooth devices. 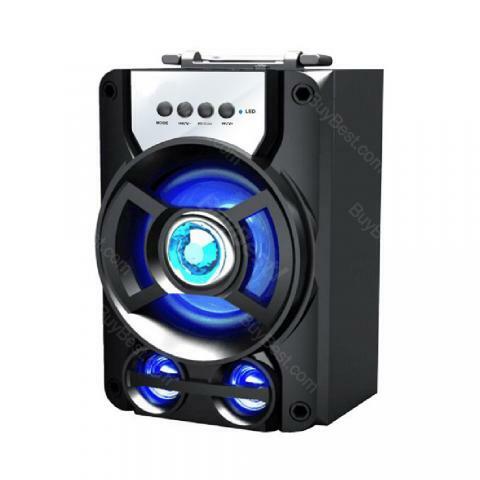 • With stereo audio input interface, easily access to computers, digital music players, mobile phones and other audio-visual products of all kinds of audio. • Built-in rechargeable high-capacity lithium battery, safe and reliable. 잘 쓰겠습니다. 일단 제품은 정말 튼튼하고 견고해서 좋습니다. 저렴한 가격에 좋은 장난감 구매한듯..아이랑 신랑이랑 온가족이 다 유용하게 쓰네요.